Join the discussion on our forums! Come discuss Potion of Polymorph over in our dedicated Potion of Polymorph discussion topic. YOU FACE JARRAXUS, EREDAR LORD OF THE BURNI~~Baaaaa!!! I bring life and ho- Beeeeaaaa! you still get the 15 face damage. I think you mean Kill Command not Deadly Shot. No it's not. Hunter can easily kill smaller minions before they attack, thus protecting his Freezing Trap from being wasted. 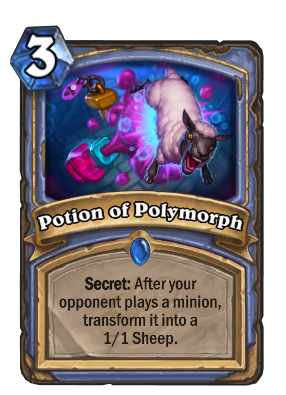 If you play Potion of Polymorph your opponent could play a weaker minion and there is nothing you can do about it. For instance: I was up against a mage with 2 secrets out and I was playing my handbuff pally. I played Grimestreet Outfitter, which is ideal vs Potion of Polymorph, but of course he did not have it in play. If he had, the battlecry would've still activated and I'd still have a 1/1 minion on the field. It is much easier for the opponent to play around. Probably a horrible card to get fromKabal Chemist as this will be the only secret potion in the potion pool probably and thus can get played around super easily. I don't agree with that. 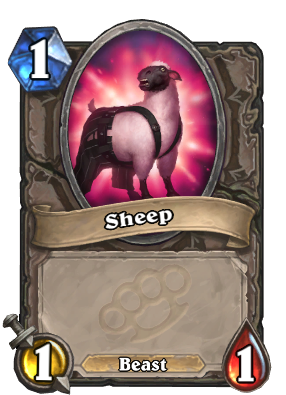 You can slow down your opponent by tricking him into thinking it is Polymorph. warlock and priest will never choose this one because they have 2 other options of potions. The card that gives potions is not a discover card.